So far, Android tablets/phones have made a great contribution on multimedia enjoyment, especially the Samsung Galaxy Tab, Galaxy S5/S4, Google Nexus 7/10, Amazon Kindle Fire HDX, Asus Transformer Prime and so forth. However, one of the few drawbacks is that the Android-powered gadget is not designed with a built-in DVD player or DVD-ROM, which means that you cannot play your DVD movies on Android tablet/phone directly. In fact, it is easy to watch DVD videos on Android as long as you got a DVD Ripper in hand. There is a number of DVD Ripping software available to help you convert DVD videos if you want to play them on your Android tablet/phone. These software programs vary, so you might be confused when you have to choose one. If so, you are recommended to use EaseFab DVD to Android converter. It is rated as the best solution out there to watch DVD movies on Android tablet/phone. As a versatile DVD ripper for Android, it can fast rip DVD movies to Android tablet/phone compatible video formats with excellent audio & video quality. Plus, lots of video presets are provided for kinds of Android devices like HTC phones, Samsung Galaxy S4, S5, Motorola Xoom, Galaxy Tab 4/3/2, Glaxy Note II/III, Kindle Fire HDX, Google Nexus 7/10, Nook HD/HD+, etc. with the best settings for playback on a certain Android device. It also converts DVD to many other popular video/audio format like WMV, AVI, FLV, 3GP, MKV, AIFF, AAC, and more. Play DVD on iPad Air, iPad Mini 2, iPad 4, the new iPad, Zune, Creative Zen, iRiver, Blackberry, Xbox 360 and more is also a simple case with this DVD converting tool. Converting DVD to Android with EaseFab DVD Ripper is simple as ABC. After downloading, follow the wizard to install and run the program. Then follow the steps below to rip DVD to Android playable videos in a few clicks! The below guide takes DVD Ripper for Windows (Windows 8 compatible) screenshots for example. First, you need to download and then launch the converter program. After that, you can load the DVD files and preview the added movies before converting. You could also take snapshots while previewing. Select an Android friendly format, e.g. H.264 .mp4 for conversion. Basically the "Android" > "Android Tablet" or "Android Phone" is a universal format for Android tablets and smartphones. Besides, there are optimized formats for Samsung, Motorola, Acer, Asus, Sony, Toshiba, HTC, etc branded Android devices; choose a proper one as you need. Or depends on your device, you can choose a suitable video format from "Android", "Samsung", Motorola, etc. catalogues. 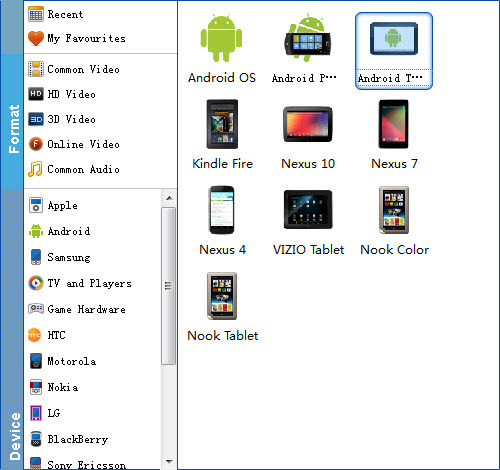 Once you do this, you can begin the process to convert DVD files to Android by clicking the Convert button. All the conversion tasks will be done at fast speed and you will get a high output quality. After that, you can connect your Android phone or tablet to computer via a USB device and transfer the videos to your device for enjoyment on the go. Get the program and start to convert DVD to play on any Android devices!